On An Overgrown Path: What price classical music's celebrity culture? What price classical music's celebrity culture? As art forms inspire and cultures come together, Rolex watches are there. For life’s defining moments and the making of maestros. More than time, they tell history. 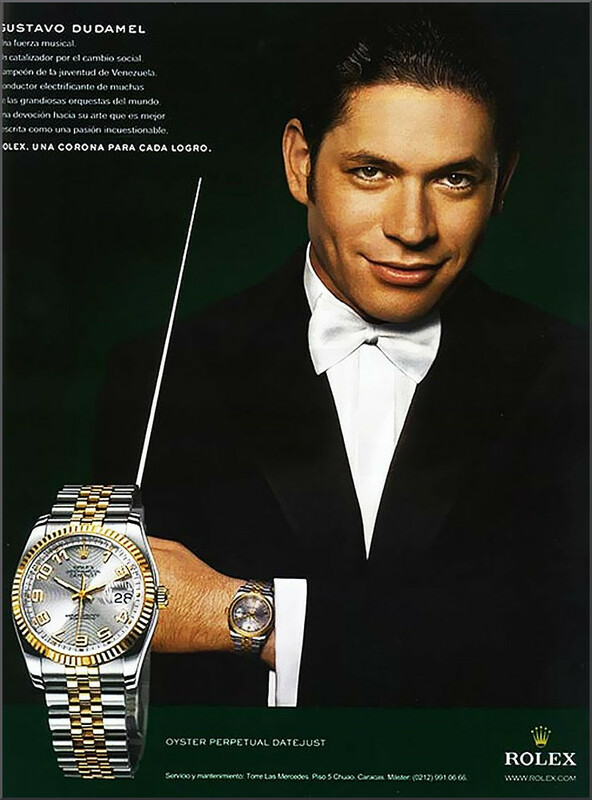 That copy accompanies a Rolex video featuring Gustavo Dudamel, and the visual comes from a press campaign. On the one hand a leading maestro flaunts his £10,000 Rolex Oyster Datejust, but on the other hand claims of penury have become the mantra of embattled classical music. Financial double-standards prevail; which means it is cool to flaunt wealth but verboten to discuss money in any context other than the lack of it. As a result, in the Guardian critic Andrew Clements concludes somewhat belatedly that Valery Gergiev "has not served the London Symphony Orchestra well as their chief conductor", but focuses solely on Gergiev's musical shortcomings, without even a passing mention of the financial cost of the celebrity conductor's term at the LSO. This fiscal shyness is hardly surprising in a music journalist. Because not only is any detailed information about orchestra finances very hard to come by, but digging down beneath the claims of financial penury risks invoking the disapproval of those that matter to a professional journalist. Which won't stop me trying to provide some fiscal background to what the respected Andrew Clements describes as the "often ...featureless mediocrity" of Gergiev's performances as the LSO's principal conductor. During Gergiev's eight year tenure as principal conductor of the London Symphony Orchestra (LSO), the orchestra will have received in the region of £16 million Arts Council England funding. Arts Council England (ACE) is an executive non-departmental public body of the UK government's Department for Culture, Media & Sport, and it supports arts and culture using public money from the government and the National Lottery. The LSO has an annual income of £16 million, so the annual ACE grant represents approximately 13% of the orchestra's income. This £2 million annual grant from public funds is material both in absolute terms and as a proportion of the LSO's total income; so there is a case for more transparency as to how it is disbursed. (The two other leading London orchestras receive similar ACE funding, so the argument also applies to them). This debate is not about whether celebrity conductors are paid too much: it is about transparency. When a minority artform receives millions of pounds in public funding, and then publicly declares that the recipient of a not inconsiderable chunk of that funding has "not served.. well", difficult questions will be asked by classical music's enemies. Those questions become even more difficult when the institutionalised resistance to explaining who is paid what becomes apparent. And all this is exacerbated by the opaque involvement of the classical music agents. What slice of the celebrity's fee goes to these agents is one of the industry's closely guarded secrets. It is around 15%, but the precise amount should not be a secret. Then there is the hot topic of tax liability. The current scandal of Facebook's evasion of UK corporation tax is just part of a much wider concern about legal tax avoidance. Presumably we can safely assume that principal conductors of London based orchestras pay their UK tax dues; but specific information as to where payments are directed would bring reassurance. More transparency on orchestra finances would bring other benefits. It would provide vital information on the problem of inequality within classical music. One viewpoint is that classical music is inadequately funded; an alternative viewpoint is that the limited funding is distributed unequally. The salary for a rank and file London musician is in the public domain - £26,000 to £37,000 - but the salary of their principal conductor is not. So the vexed question of whether available revenues are equitably distributed remains unanswered. And the problem of inequality does not just apply within orchestras. It would be informative to know how much one celebrity conductor receives compared with the total funding for struggling but essential smaller ensembles. Arts Council England sets a laudable precedent by disclosing its senior staff salaries. My view is that it should be a requirement that any orchestra or other recipient of public funding via ACE should disclose the amount and destination of its ten largest financial disbursements. Of course the music matters most; but the cost of the music also matters. It is indisputable that the London Symphony Orchestra and other orchestras do magnificent work; not only with their mainstream activities, but also in education and outreach. But if classical music wants to make a credible case for receiving significant amounts of public funding, it needs to be far more transparent as to how that money is spent. While on this thread I find it disappointing that the London Symphony Orchestra still has British American Tobacco as a corporate sponsor. In the UK, tobacco companies are allowed to sponsor cultural and sporting events on the condition that they use their company name rather than a brand of cigarettes. So the LSO is within the letter of the law. But it does not help foster an ethically responsible image for classical music. This is a hard one. The conjunction of ethics and music. Should I deplore the music of Duke Ellington in the 1920s because he developed it at the Cotton Club, funded by thugs and bootleggers? Should I deplore the music of Earl Hines and his band in Chicago because he was employed by Al Capone? Without the gangsters, bootleggers etc, what we know as classic jazz might just have withered on the vine - no recordings, no airtime. Obviously we are living in different times. If you are outside the mainstream you can use youtube, facebook and internet radio to gain exposure in a way that would have been impossible in the 1920s and 30s. But orchestral uses of web media are odd and clumsy...the streaming, the control they want to keep....why not put the music out there and gamble that the public might want to hear it live in a real acoustic? Graeme, I agree with your comment. But it only applies to my thoughts on the LSO and BAT, which were an aside rather than part of the main thrust of the post. The main thrust was non-judgemental - "This debate is not about whether celebrity conductors are paid too much: it is about transparency". If fees that represented a material part of an orchestra's outgoings were disclosed, everyone could come to their own conclusions on important questions such as whether classical music's limited funding is distributed unequally. I just ventured into the LSO accounts for 2014 filed at the Charity Commission and, as a qualified accountant, I find them rather opaque in a way that the accounts of Facebook, Google, Starbucks etc are not despite the fuss kicked up some of my more clueless colleagues. For example, I was surprised to learn that the musicians are not "employed" by the LSO. The employees are the 78 or so backroom staff plus the directors some of whom are selected from the corpus of musicians. I presume that the musicians' pay comes out of the bulk figures for Charitable Activities: Barbican concerts and Engagements. Together some £10m of direct cost is attributed to these activities. Somewhat alarmingly, these activities only generated £6m of income. I am amazed that there is not more disclosure of what is going on. It is intriguing that one member of staff is paid between £170 and 180k, a very reasonable salary for a business turning over £15m I would have thought. I am with you that it is cause for concern that we know more about the Antonio Brenzi viola than we do about how much they paid Gergiev. Given the fact that they would find it hard to survive without £2m from Arts Coiuncil, £2m from City Corporation, and £2m of sponsorship/donations, there really ought to be more clarity about where the money is going. Thanks for that Graeme. I think we need to be careful here. Although there may well be a degree opaqueness in the LSO's accounts, I am sure that they meet the statutory requirements in all ways, including disclosures. Disclosure of how much is paid to a principal conductor (or their management company) is not a statutory accounting requirement. But, in my view, disclosure should be a requirement of an orchestra (or other ensemble) receiving significant amounts of public funding. A number of ACE funded organisations receive £50k or less. So breaking down how the £2 million that the LSO (and LPO and Philharmonia) receive is spent, allows a more considered view to be taken on whether limited funding is being allocated equitably.